When it comes to prime ministers captured on screen-- obviously for looks alone (along with extra points for sheer willingness to dance himself silly when he thinks no one's looking as though he were suddenly Kevin Bacon in Footloose or Tom Cruise in Risky Business)-- you're not going to do much better than Hugh Grant in Love Actually. While of course, as hard as it is to envision a world where Hugh Grant-- stuttering and adorable as he is-- would actually be voted prime minister along with buying Billy Bob Thornton as the American president (well, okay given Obama's predecessor, the man who famously dug his "French fried potaters" would've most likely been several steps in the right direction than W.) or the fact that any woman would ever dream of cheating on Colin Firth-- overall Grant's version of the ideal prime minister is definitely the most viewer friendly rom-com one of the twenty-first century. Yet it's far from the only one and moreover, I'd urge everyone who caught Stephen Frears' Oscar winning Helen Mirren film The Queen to track down its made for British HBO companion piece The Deal-- the far superior and more politically engrossing work with Michael Sheen and David Morrissey-- which brings viewers a closer look behind those great yelling sessions of Parliament into the rivalry and friendship of Tony Blair and Gordon Brown. However, the most complete portraits of life inside not just Number 10 Downing Street but also the House of Parliament can always be found from our friends in U.K. television and the incomparable Acorn Media who brings the titles to audiences on this side of the pond. Last year, the work that first introduced me to both the magic of Acorn and mastery of British television was the '80s adaptation of Jeffrey Archer's compelling miniseries First Among Equals (starring a young Tom Wilkinson) in an absorbing political soap for intellectuals. In Equals, we watched four very different men begin their careers as humble, earnest MPs (or "Members of Parliament") as they all tried to stay in office and make their way to that most coveted and powerful address in all of London of No. 10 Downing. 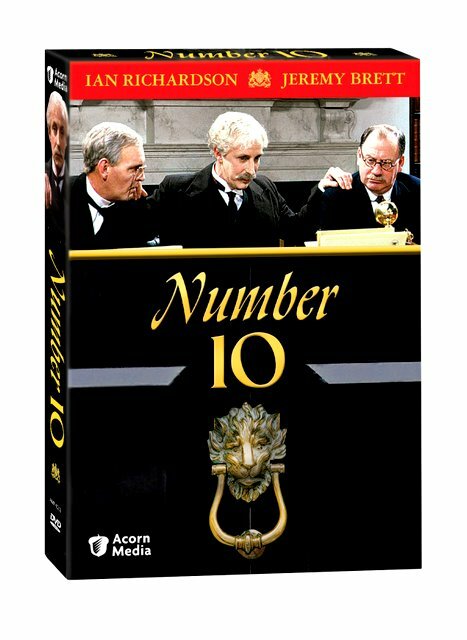 Now, almost a year following the release of the fictional (yet Archer's loosely autobiographical) Equals, Acorn once again is given access to ITV classics in debuting the network's 1983 U.K. drama Number 10 for its inaugural release in any format (VHS or DVD) to American viewers. The show is rooted in history and covers centuries of territory capsulized in an hour long format as glimpsed within the narrow scope of examining the private lives, intimate relationships, loyal circle of family and friends of seven different prime ministers who have occupied the residence with painstakingly accurate attention to detail. In a period jumping format that nicely moves freely throughout its setting which transports viewers from the turn of the century in one episode to the 1920s in another to the Napoleonic era, veteran television writer and producer Terence Feely who also helped adapt the works of Henry James into the exceptional series Affairs of the Heart manages to find a great storytelling hook that ensnares you throughout a majority of the seven episodes. In exploring the lives of some of England's most renowned or memorable prime ministers, the first episode "Old Glad Eyes" set in 1880s London uses the pious nature of William Gladstone (Denis Quilley) to trick you with its eerie, Jack the Ripper-esque set-up as he picks up prostitutes on his many "night walks." As an American viewer watching today given the endless parade of shame of politicians admittedly to infidelities, we assume we know precisely where this episode is headed until Gladstone tells the hookers that he works on behalf of the "Reclamation of Fallen Women," spending every evening trying to lead the women to a better path back to the Lord and rehabilitation before he begins to belt "Rock of Ages" and pray with his "guests," wife and staff in the kitchen. Declining police protection or more importantly a bodyguard given the unrest in Ireland and advent of bombs, it's not too long before we begin to question the real motive for Gladstone's zealous need to spend so much time among "fallen women" that suddenly makes the more than a century's old tale of "Old Glad Eyes" pretty timely. Moving from sin to celebration, we're led into 1924 to find the first Labor Party Prime Minister Ramsay MacDonald, a widowed, Scottish schoolteacher taking up residence with the assistance of an all blue-collar appointed cabinet of factory workers and drivers and his eldest daughter who has left college to become the "jill of all trades," looking after press scheduling events, the rest of the children, as well as the financial demands immediately placed on the new PM. Realizing that given their humble background and modest furnishings, they'd only have enough furniture to fill one portion of Number 10 Downing, MacDonald's daughter has to appeal to the Board of Works to provide some necessities but then realizes that they've been given the bottom of the barrel and will need to hire and pay their own staff, purchase dishes for the parties they're expected to host, as well as supply their own extravagant full evening dress wear for the prime minister. Struggling to hold everything together at the age of twenty, she tries not to burden her father with the matters of the house as he finds himself embroiled in not just the snobbery of others given his background but also the fact that they're in the middle of a full out Communist scare given the Bolshevik Revolution in Russia and his rivals are breathlessly anticipating to exploit any misstep he makes to label the man a "commie" and take him down. And indeed throughout the series, we're frequently presented with the challenges the prime ministers and their group of family, friends, and colleagues face to separate the public and private matters amidst manners of foreign policy (with the issue of Ireland a recurring theme as most prime ministers feel it should be independent as well as questions of prejudice against Catholics etc.) and of course matters of the heart when wives stun husbands by telling them they weren't quite as blind to infidelities as assumed. Yet while there were only a few that failed to capture the attention with quite the same degree as the rest, the final episode "Bloodline" starring Jeremy Brett as William Pitt the Younger is a work of such unexpected heartbreak, beauty, tenderness, and poetry that I'm amazed that nobody has made a feature film out of it (and if they have, please go ahead and correct me). Opening with a rather frightfully dark display of Dickensian like suffering as the sickly William is soon beaten by the son of his family physician on the orders of his father to try and make him stronger, we realize that as he matures during the era of the Boston Tea Party and impending American Revolution, William's health is still on the decline as he faithfully drinks port throughout the day, having done so for medicinal purposes since he was a youth. Haunted by what you and I would refer to as temper flares but what he calls "interludes"-- it becomes evident that with the overwhelming brilliance and capacity for intellectual genius running throughout his bloodline-- he's also suffering from a touch of a genetic predisposition of insanity. Having sworn to his father on his death bed that he wouldn't marry or reproduce out of fear of spreading their genetic predisposition for "interludes" any further, William Pitt the Younger's word is challenged when the middle aged man falls in love with the nineteen year old daughter of a friend whom he'd last seen five years earlier. However, far from a mid-life crisis romance, we realize that she's wise beyond her years and mathematically gifted to the point that she's able to instantly reconfigure his accounts to realize that Pitt is so good-natured and preoccupied with governmental affairs that he's being cheated by his staff. And although the world ridicules the prime minister for his relationship with a girl so young (even though given our vantage point whom we ascertain that would be fully able to take care of both him and make him sublimely happy just by walking into a room), Pitt must try to come to terms with his feelings about his bloodline before he ruins his chance at love. Overall, the series is gorgeously acted by the cast and given a great deal of careful consideration by the producers in ensuring that they present audiences with three dimensional "living biographies" of the men whose portraits we may walk by in a museum or whose name we may read abruptly. Likewise, the Acorn set which is slim-packaged and divided into 3 discs with closed captioning also comes with biographies of the prime ministers featured, some of whom you'll definitely want to learn more about. Admittedly dated and of the original '80s British TV video quality-- its technical hiccups are instantly forgiven by the substantive episodes. It's also heightened by Feely's skilled approach to tackling it as he did with Affairs of the Heart by breaking down the massive source material on the subjects into roughly hour long, compelling screen portraiture of the PMs at a certain particular point and time. For while the physical setting itself is always Number 10 (yet its appearance changes) and some of the domestic and political themes stay more or less the same over the centuries-- no two prime ministers are alike. And although the Hugh Grant dance party is a nice fantasy to have in our heads, exploring the reality is always beneficial and Acorn's Number 10 is a great place to start.